The occupation of chimney sweep is considered to be one of the oldest in the world, as chimneys have been around since ancient times, though it is only in the last two hundred years that the chimney has grown large enough to hold a man, giving rise to the image of the chimney sweep as it developed in the time of the Industrial Revolution. In the fifteenth and sixteenth centuries in Western Europe, construction of rooflines with crow-stepped gables became common to allow chimney sweeps convenient access to the chimney top. With the increased urban population, the number of houses with chimneys grew in pace and the occupation of chimney sweep became much respected and sought-after, although it is sometimes derided in verse, ballad and pantomime. In 1788, the Act for the Better Regulation of Chimney Sweepers and their Apprentices was passed, to limit a sweeper to six apprentices, at least 8 years old, but lacked enforcement. In 1840 a law was passed making it illegal for anyone under the age of 21 to sweep chimneys. The 1840 Act became a dead letter. The Chimney Sweepers Regulation Act 1864, c37. tightened controls significantly. Lord Shaftesbury was a main proponent of the Bill. 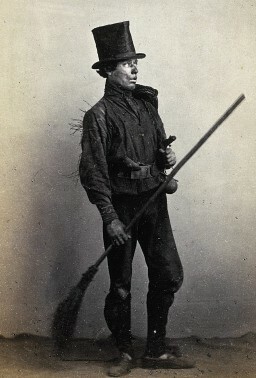 A Chimney Sweepers Act was passed in 1875 that required chimney sweepers to be authorised by the police to carry on their businesses in the district, providing enforcement. In parts of Great Britain it is considered lucky for a bride to see a chimney sweep on her wedding day. Many modern British sweeps hire themselves out to attend weddings in pursuance of this tradition. It is also considered good luck to shake hands with a chimney sweep or to be blown a kiss by one.